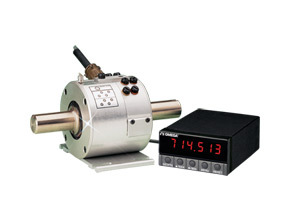 The TQ501 rotary torque sensor is ideal for measuring torque in rotating shafts. An integral slip ring assembly is used to transfer the electrical signal from rotating to stationary electronics. The slip ring consists of silver graphite brushes which rub on the rotating ring, providing an electrical path for the incoming excitation and the outgoing signal voltage. The speed sensor is a magnetic pulse that generates 60 pusles per revolution. The DPF701 is the recommended meter for use with the RPM option. 注: The optional RPM sensor is an inductive pick-up with 60 pulses per revolution output.